Kitchen remodel is a great way to increase the market value of your home and improve the functionality of your kitchen. However, it’s important to choose the right layout for both your family and the size of your kitchen space. 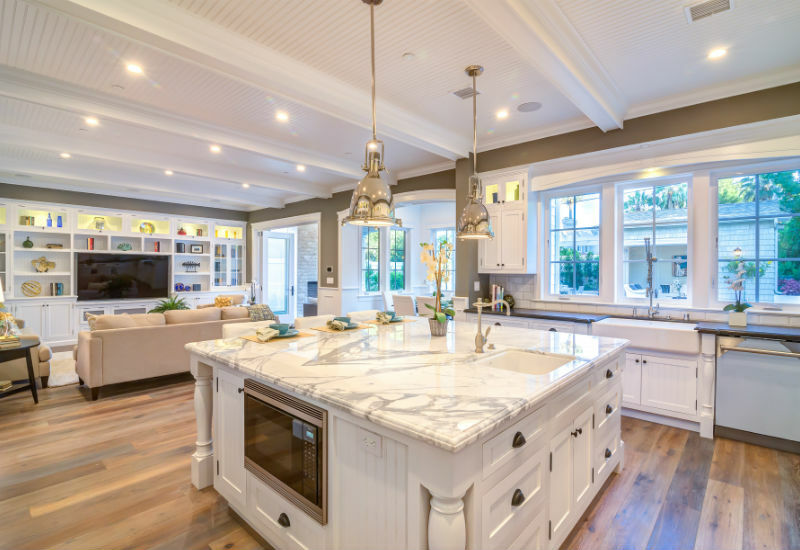 Here at Landmark Construction Crew in Low Angeles, we would like to help you understand your kitchen remodel options so that you can make an informed decision. An L-Shaped kitchen remodel is great for open-floor-plan homes where the kitchen, dining room and family room are located in the same large space. These kitchens are built into corners, and the size is only limited by the length of the walls. Some L-shaped kitchen designs can even incorporate an island for added counter space. Homeowners choose this design when they want to socialize with family members and guests while cooking. Horseshoe kitchens are also called U-shaped kitchens. This type of kitchen remodel is great for semi-open floor plans where one end of the kitchen is open to another room, like the dining room. These kitchens are built along three walls and are perfect for medium to large spaces. These kitchens tend to have lots of cabinets and ample room for preparing food. Depending on the size of the horseshoe kitchen, it can accommodate more than one cook and allow the cook to communicate with other family members. Galley kitchens are great in small spaces where only one person cooks. This type of kitchen remodel contains all the appliances, counters and cabinets on two walls. Homeowners love this style because everything is within easy reach. However, they can make the cook feel slightly disconnected from the rest of the family members while they are preparing food. Peninsula kitchens are great for smaller spaces that still need to be multi-functional and for homes that do not have a dedicated dining area. This kitchen remodel includes a peninsula that is anchored to one of the counters and can be an add-on feature in horseshoe-shaped and L-shaped kitchens. The peninsula can be used for food prep, homework and recreational activities like playing board games. Here at Landmark Construction Crew, we can help you turn your current kitchen into your dream kitchen with a new layout, flooring, cabinets and appliances. To get a free estimate and learn more about our kitchen remodel services, call us at 818-319-4970.